You have probably met the famous Sugar Crumb Crispies on my blog, and might have had the privilege to be introduced to its sister recipes, the Oreo Crumb Crispies, but now I would like to introduce you to the next family member, Cake Batter Crumb Crispies. This recipe whips up in minutes and is a family favorite! So many delicious flavors and textures combine to make each bite perfection. In a medium bowl, Cut cold butter into sugars, cake mix and flour to form crumbs. To make glaze: Blend together all the glaze ingredients and drizzle over Sugar Crumb Crispies. These sound like a seriously good idea! They look so yummy too! Where have I been? 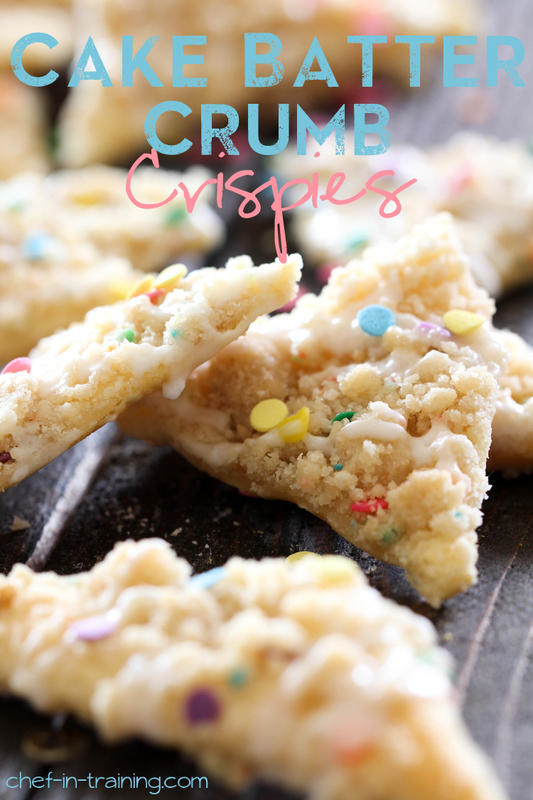 I've never heard of "Crumb Crispies" but not that I have I can't wait to try these!! Oh my gosh these are too perfect! These look so yummy! My family would love them! When do you put the little sugar sprinkles on? Before you bake them, or after they come out of the oven? They look delish! I can't wait to try them! They look like something that would be lovely to serve with coffee and tea at family gatherings. Thank you so much for sharing this great, easy recipe! Oh yum!!! These look so good!!! Is it just me, or can everybody but me, see the actual recipe???? I love this recipe.. Its perfect for my baby shower. And, it dosnt hurt that you posted it on my birthday. It almost screams "Make Me" just for that reason lol! Have you tried carrot cake mix?